Had this wine on SAT at a friend’s house. He bought it from Spain almost 1 year ago and finally uncorked it this weekend. 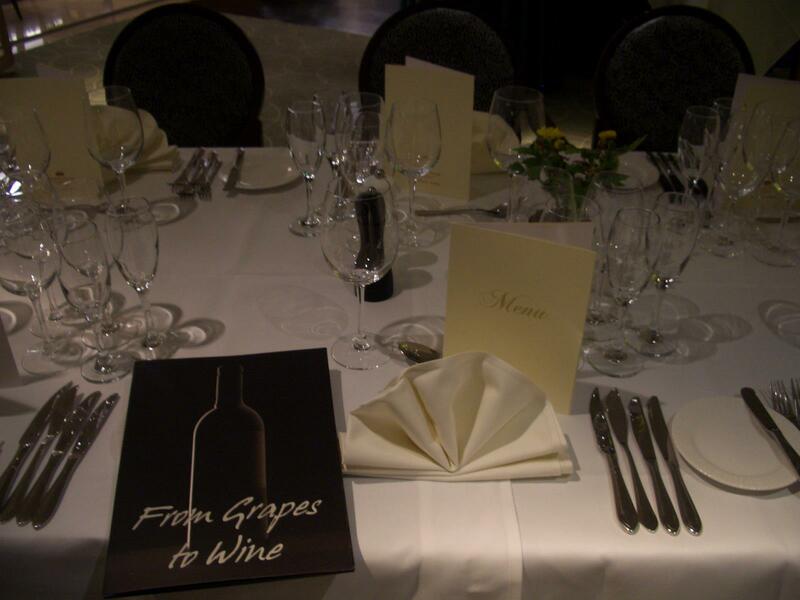 Last SUN, on November 20, 2011, I organized my first Wine dinner themed: Bordeaux of the ’90s. The place was the cozy and fancy The Vineyard section from Crowne Plaza’s La Veranda restaurant. We were 16 people all together and enjoyed an almost 5 h dinner and 6 courses meal. 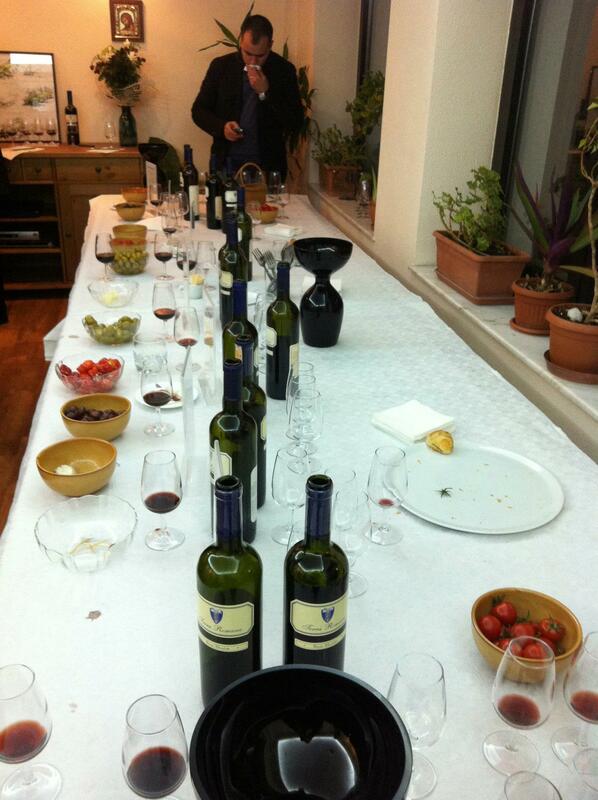 There were 11 foreign wines scheduled for tasting, plus another 3 Romanians that we served before and after dinner. I uncorked the wines around 18:00 and I was happy to discover that almost all corks went out in one piece. 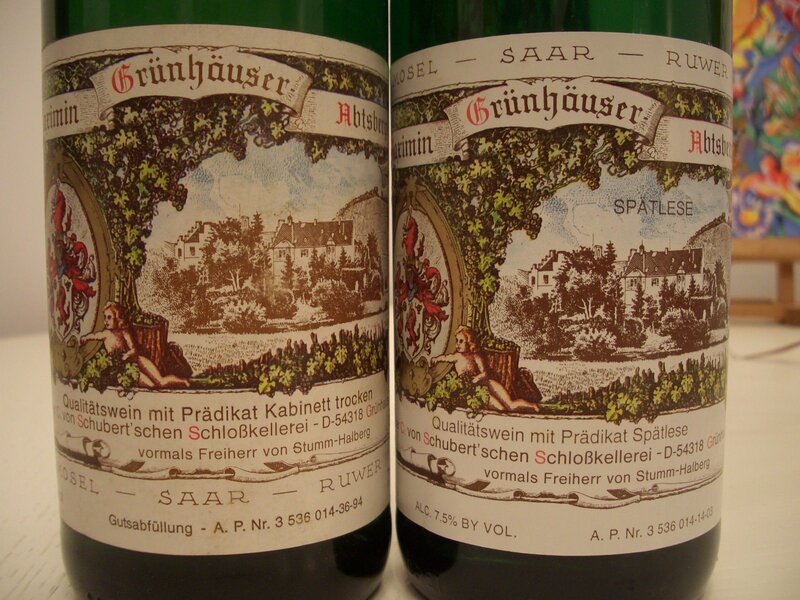 The most difficult to pull out were the corks of the two oldest wines: 1970 and 1975. However there was no problem to uncork them and no piece of cork managed to fall in the bottle. The event initially scheduled for 19:30, started around 20:00 when all the people arrived; meanwhile a 2010 Sole Sauvignon Blanc from Recas was served to open up the appetite for what was scheduled to come. An easy drinking wine that served its purpose very well. The first course of the meal was Tuna Tartare with baby greens and avocado served with two Champagne’s: a white vintage from Moutard and a rose Bollinger NV. This is a rather unusual Champagne as it contains all six grapes varieties allowed to be grown in Champagne. 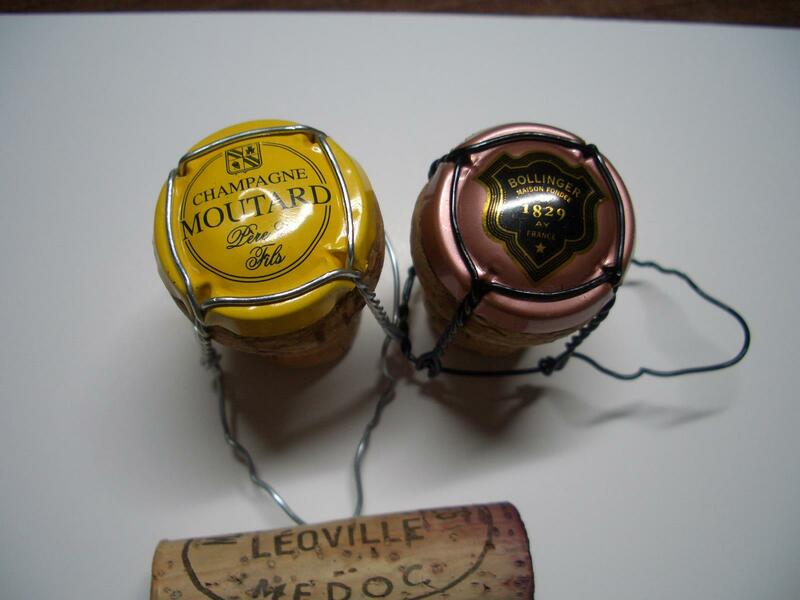 Most of the producers use only the three well known Chardonnay, Pinot Noir and Pinot Meunier. 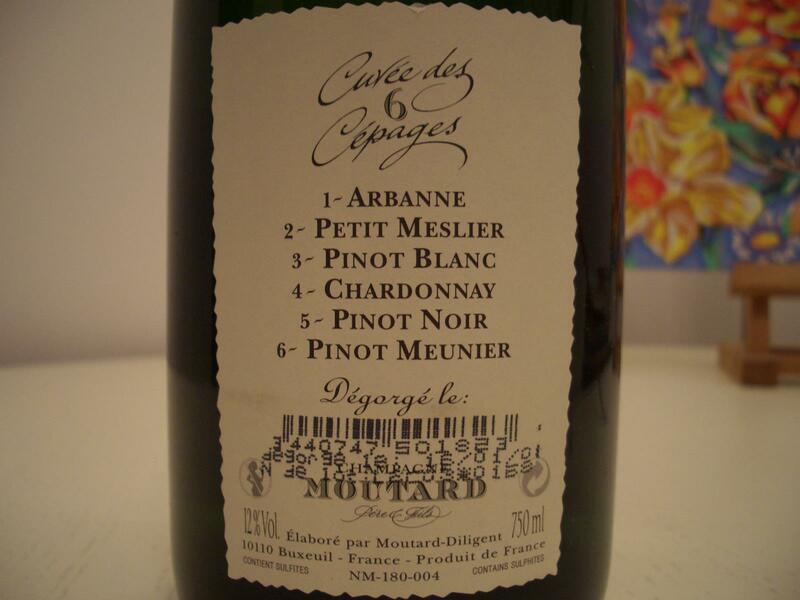 Moutard uses for this blend also Arbanne, Pinot Blanc and Petit Meslier. These latter three grape varieties are grown only marginally in Champagne and considered to produce a wine of lesser quality. 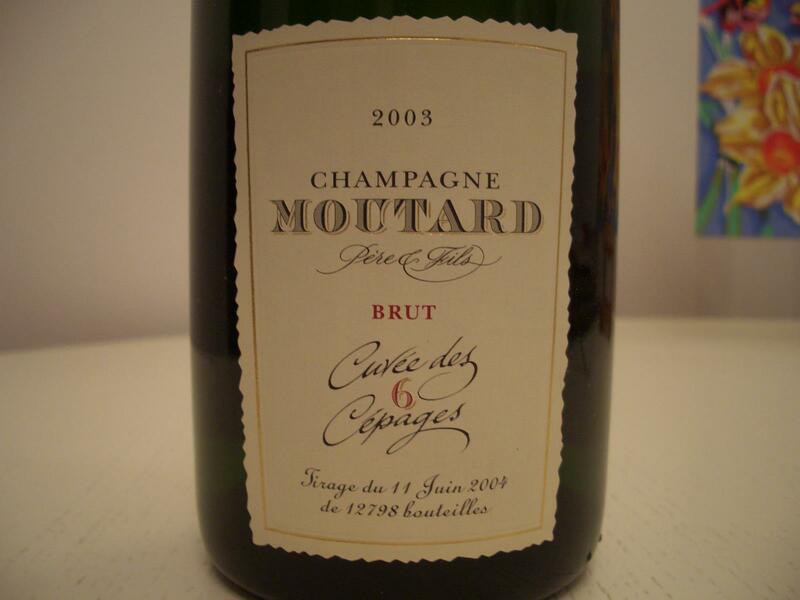 Moutard is a well known producer of spirits and until 2000 its Champagnes lacked raciness and were rather average. But a major shift in quality was made in the early 2000 and the level of quality continues to climb every year ever since. There is even a 100% Arbanne Vieilles Vignes Champagne produced by Moutard which unfortunately I did not taste so far. 2003 was a challenging vintage in Champagne in the face of an unprecedented heat wave during the summer months. The frosts conditions early in the season led to the demise of half of the crop, so the Champagne production from 2003 was severely restricted. The harvest began as early as the last week of August, in a way similar to 2011. 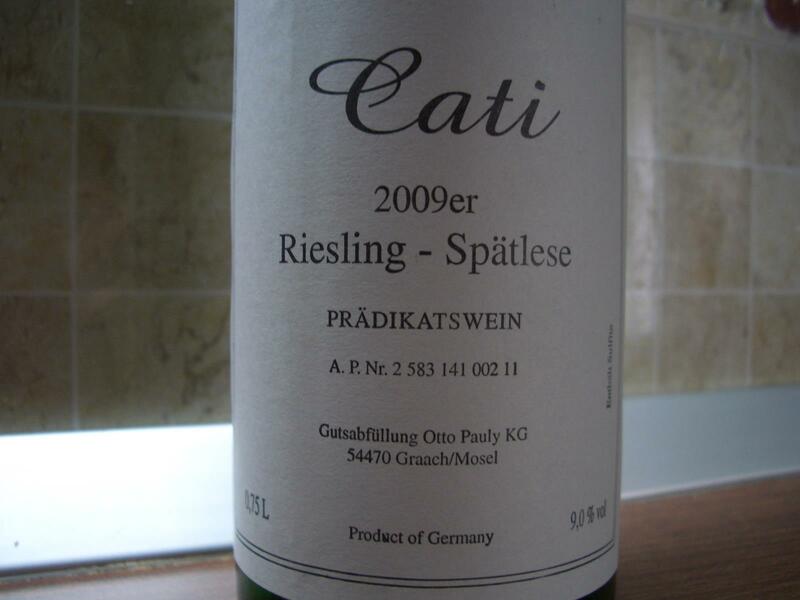 As a result, grapes enjoyed exceptional ripeness and fruitiness, but low acidity. Pinot Noir fared better than the Chardonnay. This Champagne was kindly provided by the importer: Cramele Halewood. Bollinger is one of the few producers that uses oak casks during the first fermentation process. The second course of the meal was Foie-gras terrine with caramelized apple served next to three German Rieslings from the left bank of the Ruwer river, about two kilometres before it joins the Mosel. 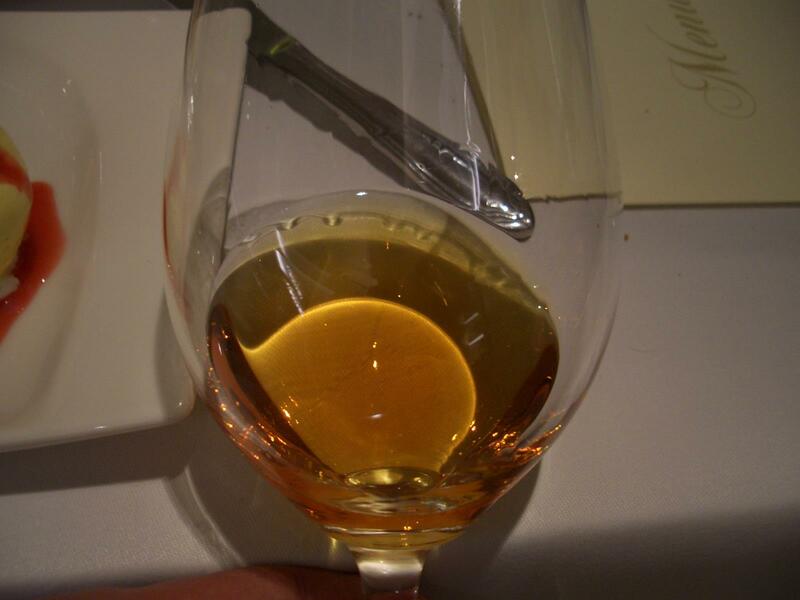 1993 was a small, excellent vintage: lots of Auslesen/botrytis, with near perfect harmony. Wonderful to drink now. 2002 vintage is a small miracle how the Riesling grapes survived one of the wettest harvests on record to give ripe, succulent, lively wines (mostly Kabinett and Spatlese), and attractive drunk young or mature. A wine kindly provided by the importer: Winero. The wine comes from the small 2 ha property owned by the same partnership that owns Enira in Bulgaria: Stephan von Neipperg and dr Karl Heintz Hauptmann. 2009 was, as far as I understood, their first vintage produced. Next course of the meal was Pancetta wrapped Atlantic cod, corn and mushrooms with veal jus vinaigrette. 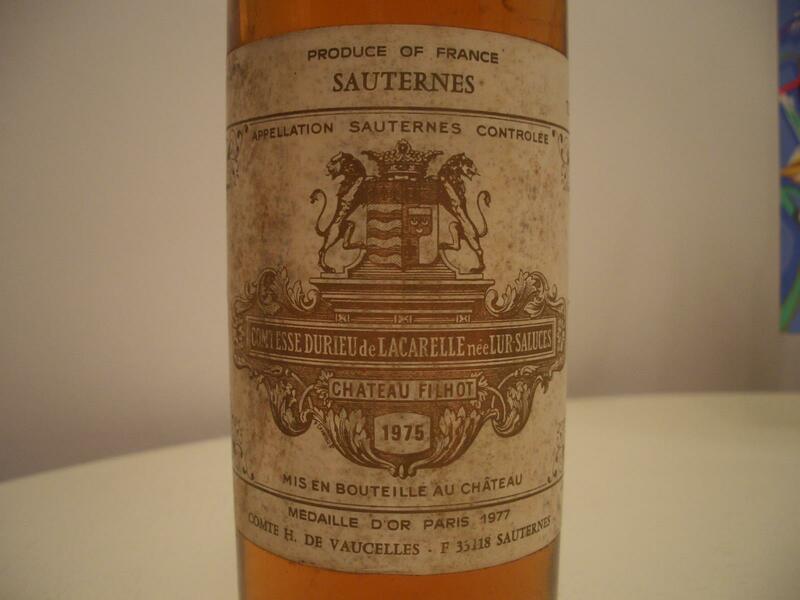 For this dish the chef suggested the oldest wine of the tasting: a 1970 Pomerol. 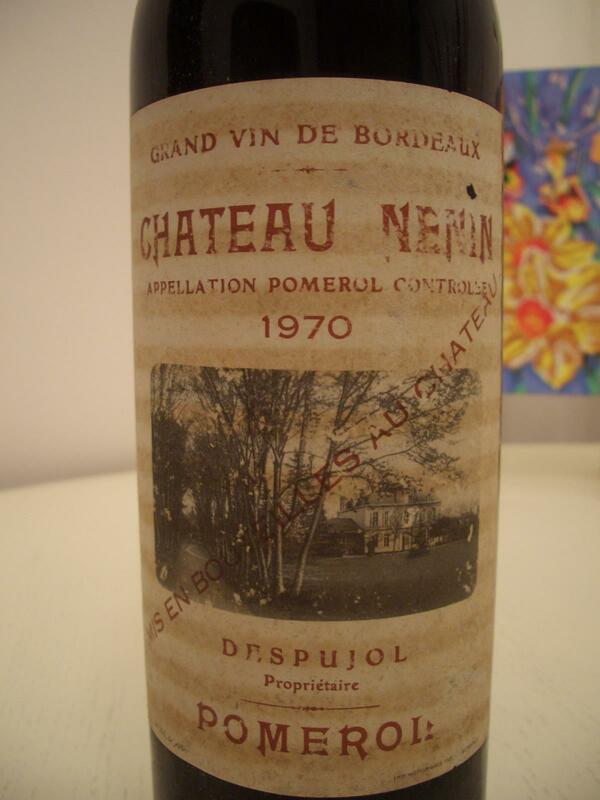 1970 was successful throughout Bordeaux, but St-Emilion and Pomerol produced many of the top wines. 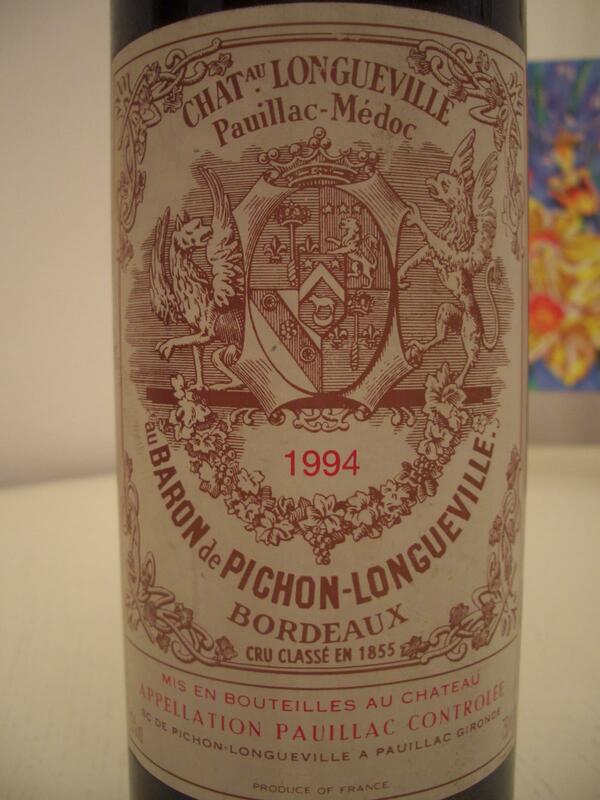 The Beef Mignon with potato puree, foie-gras Ravioli, wax beans and veal reduction was served in the company of three wines: a 1990 Saint-Emilion, a 1994 Pauillac and a 1995 Pessac Leognan. 1990 was overall a hotter and drier year than 1989. Sugar levels were close to the highs of 1989. Because of the size of the crop, many conscientious estates practiced green-harvesting in July to reduce the yields. It was also the driest year since 1961. Overall 1990 was an excellent vintage. 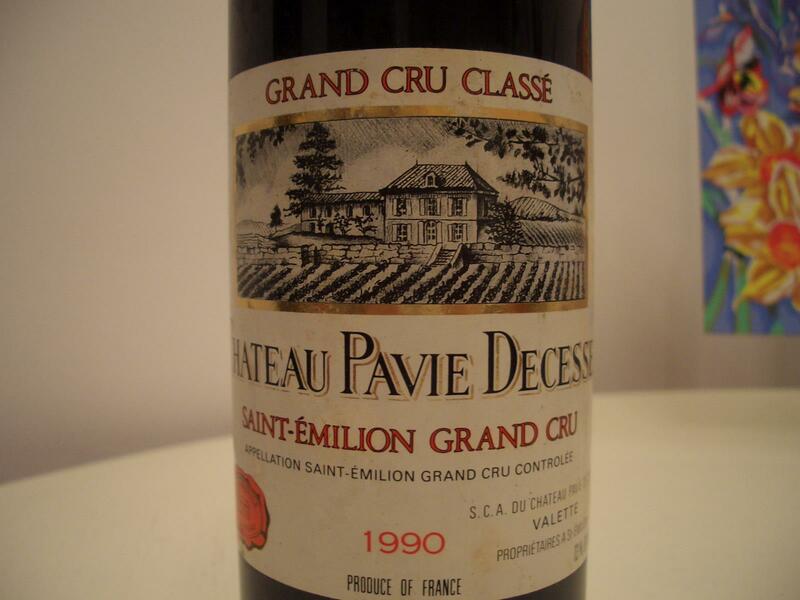 I was talking to a friend some time ago and mentioned him the wines for this tasting and he was convinced that the 1990 Pavie Decesse is a dead wine. I am happy to confirm M. that not only this is not dead, but the wine is really charming and pleased most of the guests. In 1994 conditions looked highly promising by early September, and then from September 7 the rain began and continued for most of the month. Fortunately temperatures were fairly cool and there was little rot, but the wet weather did cause some dilution. Growers did not delay the harvest, as the grapes, especially Merlot, were as ripe as they were going to get, and there was nothing to be gained by waiting. The red wines turned out to be dark, quite rich and tannic. Some critics declared themselves unimpressed by 1995, but with time it has become clear that this is easily the best vintage since 1990, and the best wines are evolving slowly but impressively. They will be long-lived. 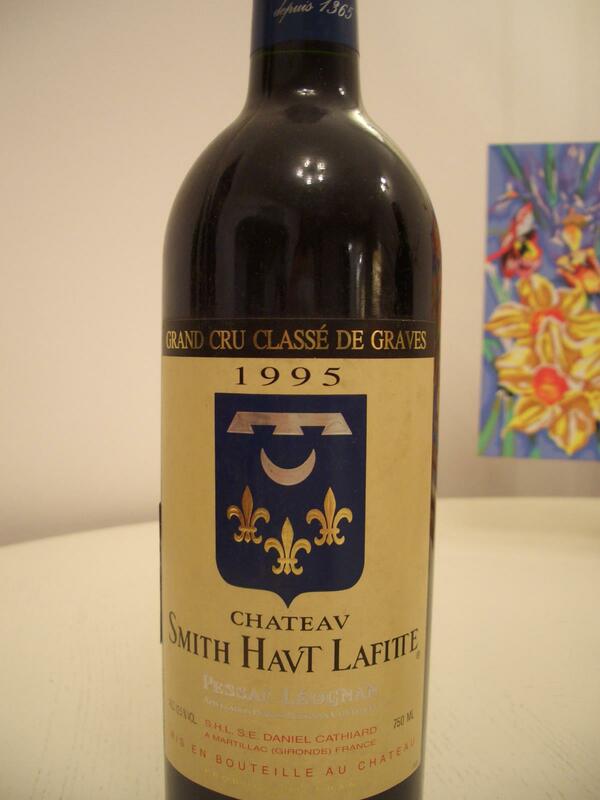 I was a little bit nervous about this Smith Haut Lafitte because I already had a bad experience with a corked 1995 ( a couple of weeks ago) and a cooked 1985 almost one year ago. Fortunately this bottle showed well. 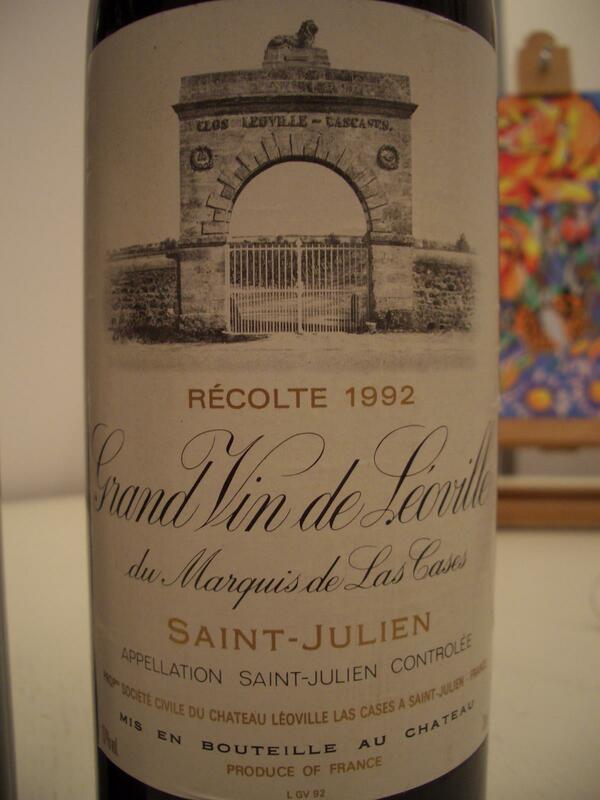 The Cheese with beetroot jam dish was served with a 1992 Saint Julien. 1992: this was the wettest summer in fifty years. Green-harvesting was essential to reduce potentially enormous yields. Rain fell in late August and again on September 20, the day before the harvest was set to begin, and intermittent rain and cool conditions continued for 3 weeks. Rot made selection essential, and muddy conditions hampered estates used to harvesting by machine. Sugar levels were modest in both Merlot and the Cabernets. 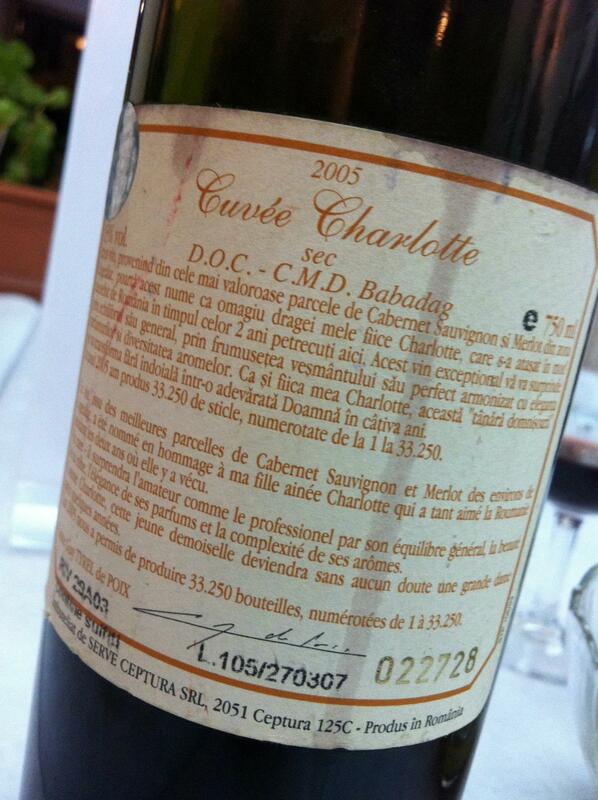 The quality of the wine was lackluster, with much dilution; the Northern Medoc fared best. This proved a wretched vintage on the Right Bank, where there was widespread rot, although in Pomerol, where picking was under way before the heaviest rains fell, some adequate wines were made. For dessert we had Quince and plum crumble with Vanilla ice-cream and was served in the company of three wines: a 1975 Sauternes, a Romanian sweet wine not yet launched on the Romanian market and a 2007 Stirbey Feteasca Regala Genius Loci, which for me is a classic wine to pair with a crumble dessert. I am a big fan of 2007 Genius Loci but I absolutely love it paired with a tart like dessert. The year was acclaimed as great, but it became more apparent that many wines had more tannin than fruit. There is great variation from estate to estate. 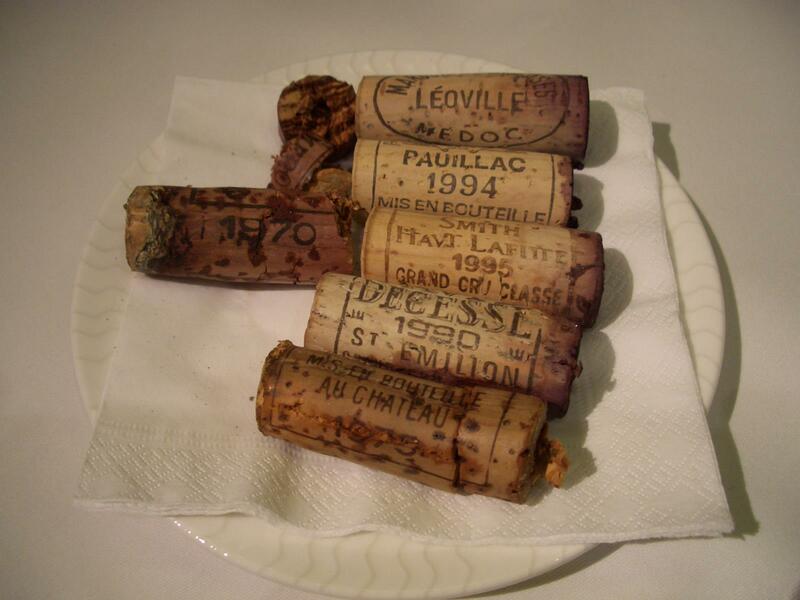 Many of the best wines came from precocious soils, such as Haut-Brion, Cheval Blanc and Petrus. In Sauternes an Indian summer permitted the gradual spread of botrytis. The wines are fruity and stylish and still drinking well. The night finished rather late for a regular SUN evening, but I am glad that we were able to enjoy the food and talk about wines and wine regions. I am also glad that my audience had a lot of good and interesting questions about what we had tonight and it was not just a simple presentation and a monologue from my side. Therefore I would also like to thank my guests for their presence and I am looking forward to taste wines together again. For more pictures from this event please go here. 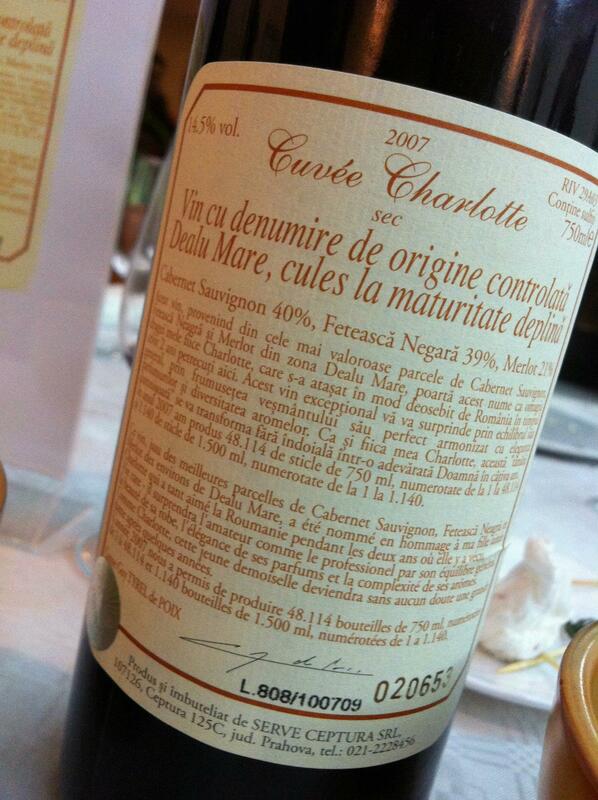 I had this wine on SUN with lunch and what a nice surprise it was. 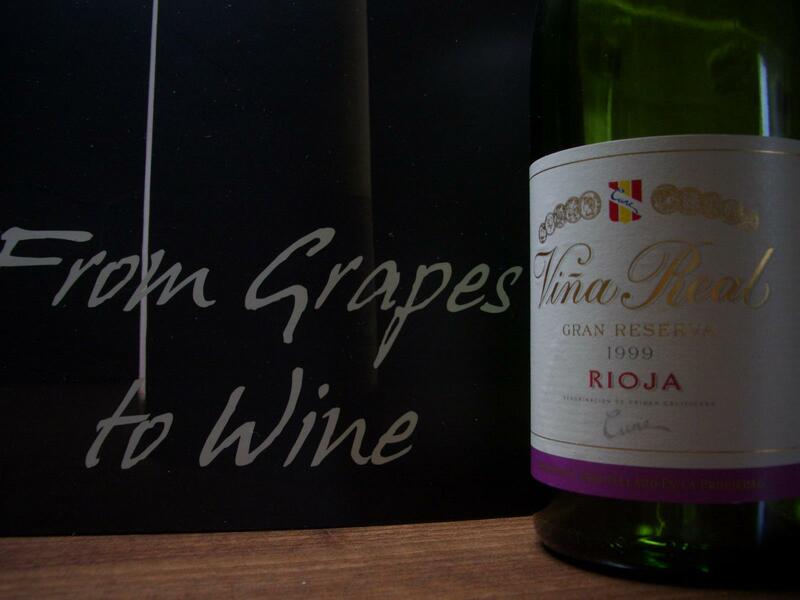 While 1997 is not a sound vintage in Rioja, this producer managed to launch a prodigy. 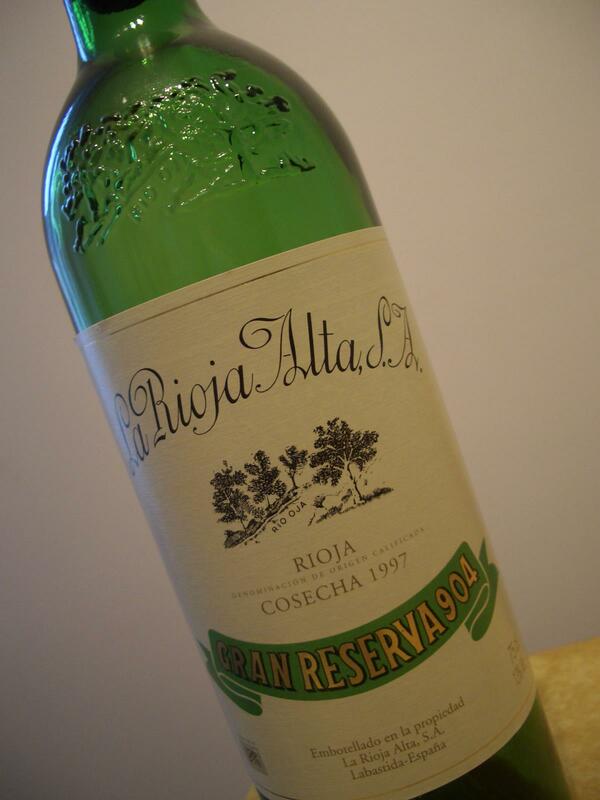 La Rioja Alta is one of the few Spanish bodegas that maintains the traditional Rioja style, with long aging in American oak. There are three Reserva styles: Alberdi is light and cedary, with over-tonnes of tobacco and redcurrants; Ardanza riper, a touch spicier but still very elegant, and then the top wines are Gran Reserva 904 and the fine Gran Reserva 890, aged 6 years in oak. The wine successfully combines, at this stage, some of the primary aromas with the ones given by a graceful aging in the bottle. The polished and well integrated tannins and the balanced acidity will ensure a glorious future for this wine. There is good aging potential even further. Traditional Rioja style is good in its own, but it just blossoms and is even better when paired with food. I had this wine with barbecued lamb chops and I have to say that the richness of the lamb and the spices used to prepare the meat emphasized the primary fruity aromas of the wine. Just loved it. I was invited this week by SERVE at a preview of Cuvee Charlotte 2008. The invitation also mentioned “some other things also” so I was naturally curious to see what were the other things. I arrived a bit later than scheduled and I was invited by Mr Savulescu to taste a glass of Sauvignon Blanc 2011 taken straight from the tank. I was the only one in the room together with Mr Savulescu so I had the impression that I arrived too late. I found out after a few minutes that the main event was still taking place upstairs where all the other guests were still tasting Cuvee Charlotte. The 2011 Sauvignon Blanc from tank, still on the lees and unfiltered, is a good appearance, as the aromas are intense and well defined, and the wine has a bright acidity and good length in the mouth. I was finally guided upstairs where a group of roughly 10-12 people: the guys from Vinul.ro, most of the wine bloggers from Bucharest and Catalin Paduraru, in the company of Mr Aurel Rotarescu – SERVE’s winemaker, were tasting a vertical of 7 vintages of Cuvee Charlotte. For the ones not familiar with the wine, Cuvee Charlotte is SERVE’s flagship red wine and one of the first premium wines ever released in Romania starting with the 1999 vintage. The hosts kindly provided 2 bottles of each vintage, starting with 2001 until 2008, the exception being 2004. 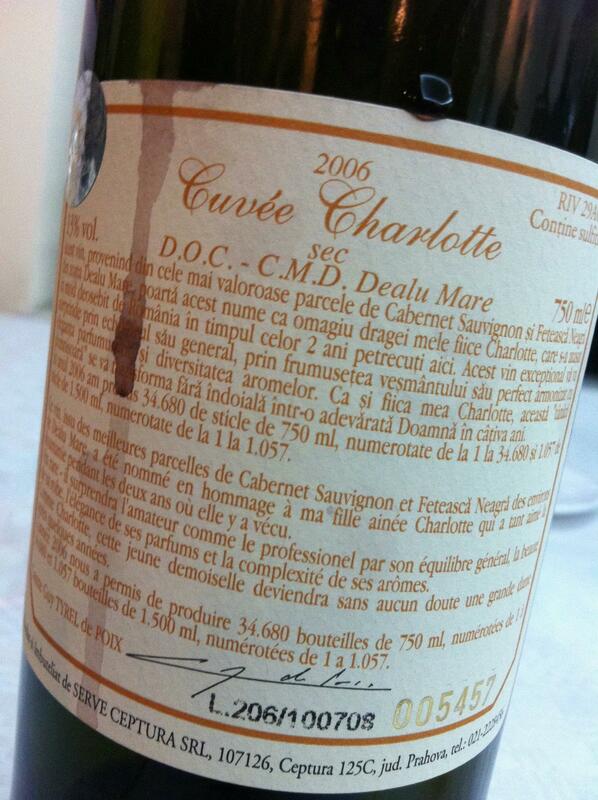 The 2008 version of Cuvee Charlotte will officially be launched next week during the Good Wine fair. It is important to mention a few things about the wines tasted. 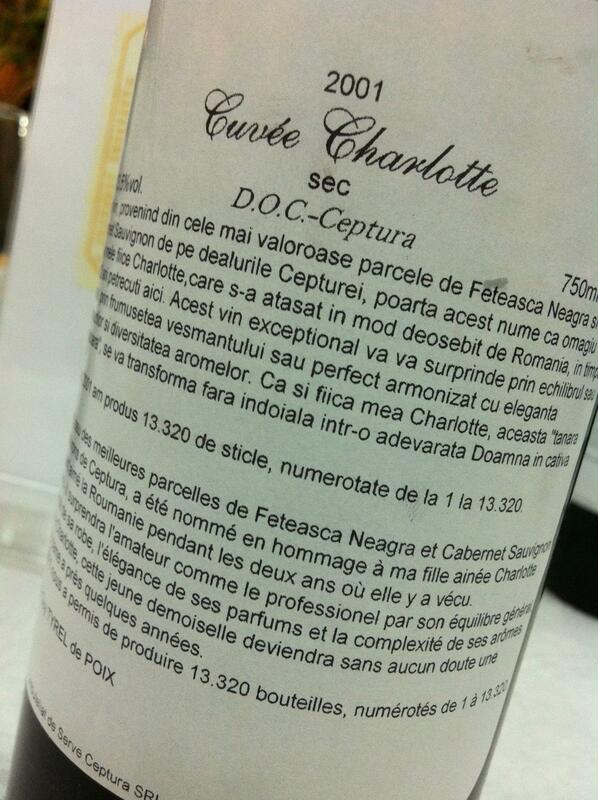 The typical blend for Cuvee Charlotte is a mix of Feteasca Neagra with Merlot and/or Cabernet Sauvignon. 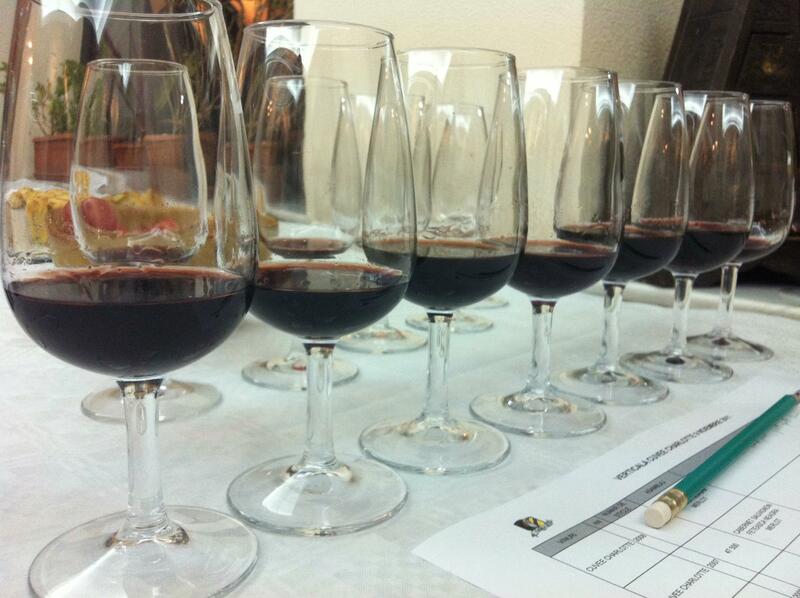 For example, the vintages 2001-2006 were blends of Feteasca Neagra and Cabernet Sauvignon. 2007 was a blend of all 3 grapes, and in 2008 there is only Feteasca Neagra and Merlot. Unfortunately, older vintages than 2007 are no longer available. When they are, they are usually overpriced. I started tasting the wines from the youngest to the oldest. Blend of Feteasca Neagra and Merlot. 15,000 bottles produced. Also has a very long story printed on the back-label, while the front label maintains the same design as the original 1999 version. Blend of Cabernet Sauvignon, Feteasca Neagra and Merlot. 47,500 bottles produced. Blend of Feteasca Neagra and Cabernet Sauvignon. 34,680 bottles produced. Blend of Feteasca Neagra and Cabernet Sauvignon. 33,250 bottles produced. 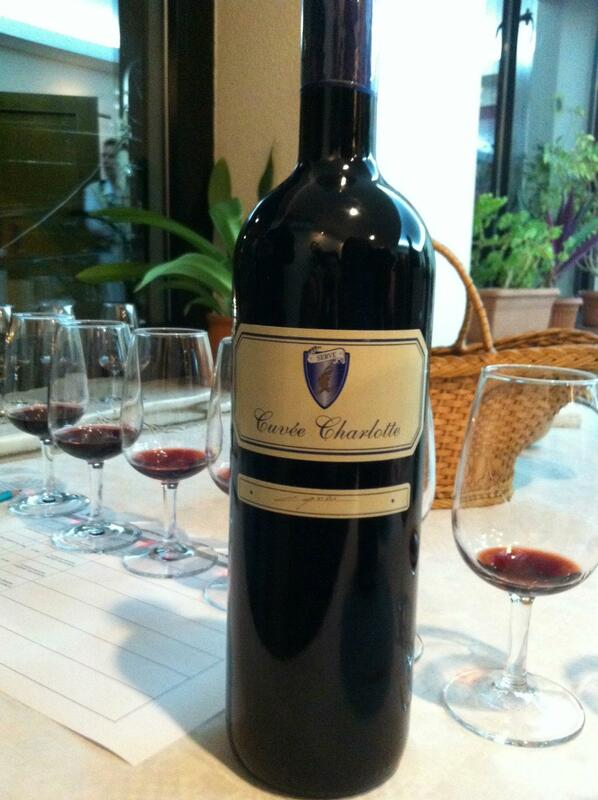 2004 was a poor vintage for this wine, so the host decided to exclude the wine from the tasting. A good initiative. Blend of Feteasca Neagra and Cabernet Sauvignon. 25,328 bottle produced. Blend of Feteasca Neagra and Cabernet Sauvignon. 21,200 bottles produced. Mr Rotarescu explained that 2002 was very much similar to the 2003 in terms of weather, but had a touch more rain keeping things better balanced. Blend of Feteasca Neagra and Cabernet Sauvignon. 13,320 bottles produced. I am always very happy to try older vintages of Romanian wines as this is certainly the best way to see the aging potential they have. Unfortunately there are not many wineries that can organize such tastings and the reason is that usually they are happy to get rid of the full stock as soon as possible. In my opinion, this is a big mistake as there is no way to keep a track of how your work evolves in time. Or perhaps it is this reason why they are happy to deplete the stock as soon as possible, as those premium wines are not built to last. For me, the wines of the night were the 2002 and the 2008 Cuvee Charlotte. There are certain similarities between the two wines. 2008 is definitely a wine to follow as the oak is well mastered, the aromas and flavors are rich and intense, and the wine promises a lot. This weekend was rich in Chateauneuf du pape wines. 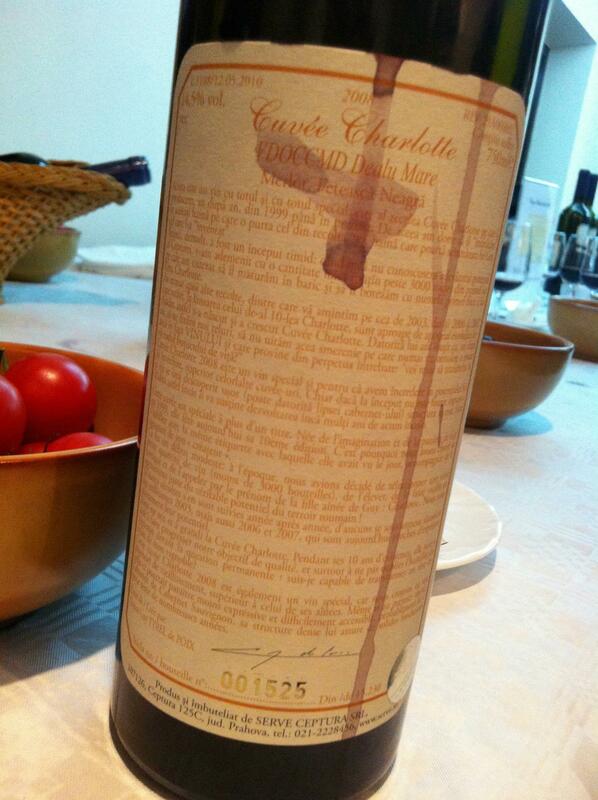 On SAT evening I had a 2001 Pierre Usseglio that did not show very well. 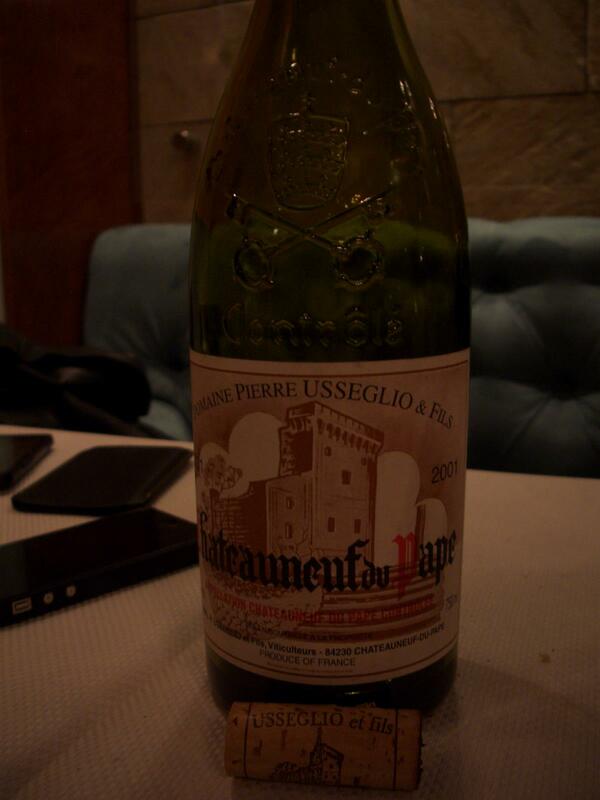 On SUN I had another Chateauneuf du pape, even younger coming from the 2006 vintage. 2006 produced some very good wines, certainly more approachable on the short term compared to the 2005. Great appearance from this producer. Şcoala Vinului este realizată de Asociaţia Degustătorilor din România şi Organizaţia Somelierilor din România 2011. 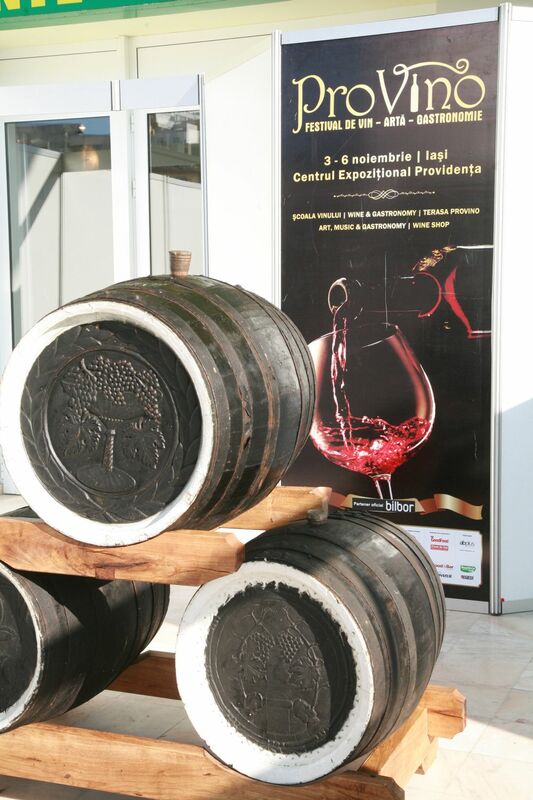 Vinurile vedetă de la Festivalul PROVINO vor fi promovate la „Wine & Gastronomy”prin ritualul degustării şi prezentări profesioniste. Sesiunile de degustări realizate în spaţiul special amenajat de organizatori vor fi conduse de membri Asociaţiei Degustătorilor Autorizaţi din România şi Organizaţia Somelierilor din România 2011. I recently had dinner at Restaurant Market8 located in the Dorobanti area. Their chef is Florin Dumitrescu, the youngest of the three chefs that will be judging MasterChef Romania TV show. The shooting for the show will start in January and the show will be broadcasted in 2012. Meanwhile Florin is doing a good job at Market8. 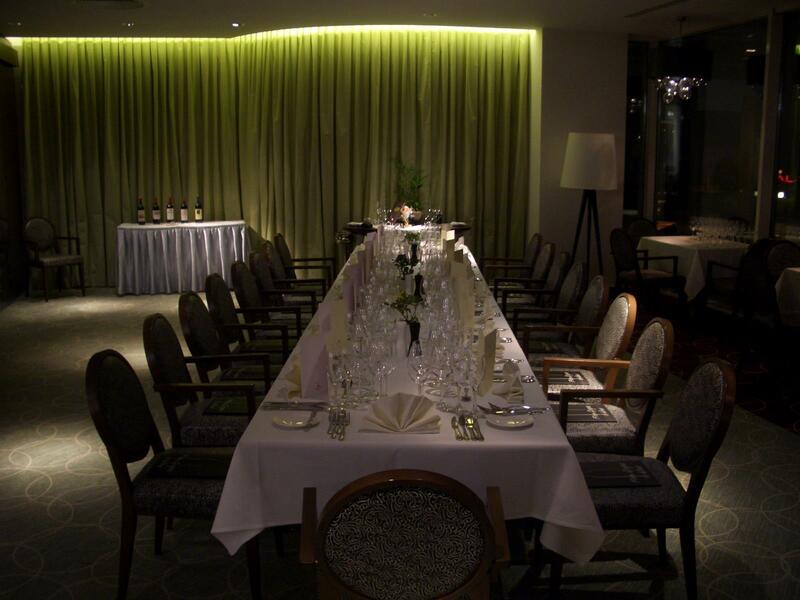 The restaurant itself was decorated by Venera Arapu and has a posh design. For dinner I had, as appetizer, pumpkin gnocchi in an orange sauce with shavings of orange peel that was rich, fresh and delicious. A dish that is definitely worth trying. Unfortunately no picture taken. 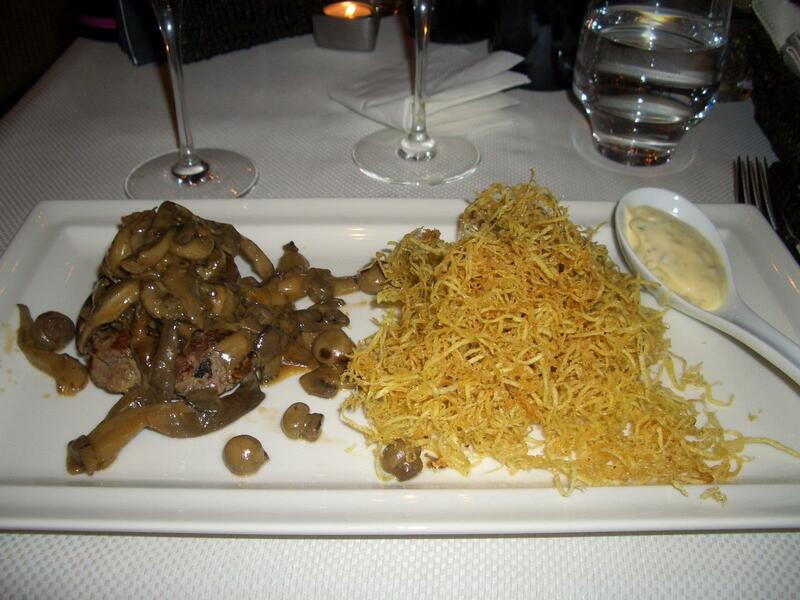 The main course was fillet mignon with mushrooms and French fries paille (which are actually the smoothest type of French fries I ever had). The food was really good at Market8. 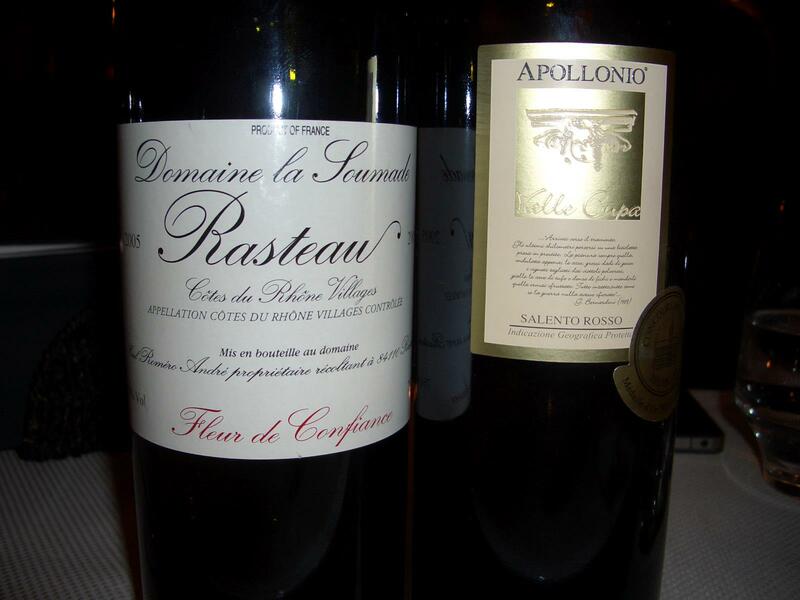 I drank a French Cotes du Rhone Villages and an Italian wine. Blend of 50% Primitivo and 50% Negroamaro, aged for 12 months in French oak. 14.5% alc. Awarded a Gold Medal at Concours Mondiale de Bruxelles in 2010. The Italian wine went well with the orange sauced gnocchi as they are both sweet, but for me it was very difficult to enjoy this wine on its own. There is simply too much cola like vanilla and sweetness. However, it can charm women.